Their child is upset with starting school or has grown resentful of school. They’re crying or angry or making excuses not to go. Does this sound normal? Does this sound healthy? When you remove how common this situation is… when you imagine something else invoking this response… Is it uncomfortable? I know for me it sure is. Maybe instead of dismissing their behaviour as ‘normal’, we should listen. The message they are sending is loud and clear and in any other situation it would be taken seriously. But because it’s related to school it’s seen as necessary and expected and therefore not a big deal. Maybe children should be educated in ways that better meet their biological needs. Maybe we should demand that that happens. And if it doesn’t? Maybe we should opt-out altogether. – Sara from Happiness is here. Do children adjust to school? Of course many children adjust! Just because children are adaptable doesn’t make it okay. Children adjust to the oppression, lack of freedoms, autonomy, and respect in schools in a similar way to how many babies adjust to being left to cry it out and ‘self soothe‘. Schooled children become complacent. Their cries and concerns are belittled and hushed. They grow to feel unheard and to expect that their concern isn’t valued. Then they often (on different time lines) standardise. All while they watch as all the kids around them do it too. ‘Normalise’. This quote really affects me because I feel it deeply for my inner child. Schooling and all it entailed re-shaped me and almost entirely in ways I wish it didn’t. But it’s school so it’s okay? Compulsory schooling can be a robbery of childhood, but an accepted one. The question isn’t whether children can adjust, but whether they should have to. Should children have to adjust to an existence with less respect and autonomy? Should children have to adjust to an authoritarian environment? For those who are used to a respectful environment at home, the contrast is even more jarring. A child protesting school is sometimes simply reacting to this clear change in treatment. A child who has lived in a respectful environment? Yeah, it’s going to be hard to reconcile the reality they live at home where they are autonomous and trusted with the one that they are required to endure at school. It doesn’t feel right or fair or okay; one might even say a child resisting schooled control is showing signs of healthy self worth. – Jitterberry. Some even begin to not hate it. Why? How? Well because it is their normal – they don’t know what it’s like to be truly valued, heard, respected and free. This is the best they know and they’re surrounded by others who are controlled and obedient. I’ve shared previously how I loved school. I question whether this is a healthy response. Would you think it was a positive thing if your child enjoyed something else that was founded on force, expectations, grading, testing, indoctrination, control, punishment/rewards and standardisation? Because this is the norm for most, this cycle feeds itself. It doesn’t take much to make this adaptation to school feel normal and consequently okay. So continues the mentality that this institutionalisation and lack of freedom is normal and expected. Many will go on to school their own children. That’s how a society is able to force, manipulate, take away freedoms and autonomy – make it the norm. Outcast those who are individual and challenge this. Make it much easier and simpler to follow the crowd. “One of the weirdest characteristics of education in our (western) society… is that our approach to education is extraordinarily authoritarian. It is obsessed with compulsion and control. So the child in the modern classroom may not move, speak, sing, laugh, eat, drink, read, write, think their own thoughts, look out the window, or even use the toilet without explicit permission from an authority figure. …In WEIRD (western educated industrialised rich democratic) societies we are so habituated to this appalling lack of personal freedom that it has become functionally invisible to us and in a truly Orwellian twist, many people now consider it a ‘fundamental human right’ to be legally compelled to learn what somebody in authority says they have to learn.” – Carol Black. So do children adapt to school? Often, yes. But should they have to? What are they giving up in order to? Is that something you feel comfortable with? First I want to say that I love your work and it has been enormously helpful and life-giving as I’ve been learning to parent my children in a new way. I also very much appreciate your insight about compulsory schooling. The one thing that keeps coming to mind is a gentle reminder that just focusing on the negative aspects of schooling can become a distraction from the main work of becoming a respectful parent. As someone who was homeschooled, I can assure you that experiencing “oppression, lack of freedoms, autonomy, and respect” can be just as much of an issue for children outside of traditional schools – perhaps even more so than for children who have a supportive, respectful family structure but still have to attend school. The real issue, as you often point out, is the way that children are viewed and treated in the world throughout all aspects of their lives. For some children, traditional schools are the only option, or at least the only option for a period of their lives due to family situations. Of course we want better for our own children, but we also want better for ALL children. And I think that may mean being mindful that this isn’t about schools being the enemy, but about all of us working together to help improve society for children, regardless of what form of education is available to them. Homeschooling/Unschooling in itself is not the silver bullet, as I know from experience these things can also be undertaken with a lack of respect to children and a disregard of their autonomy. The main thing is the everyday living into respect, the kindness, compassion, understanding, and empathy in our families that you so beautifully advocate. If we can do these things AND homeschool/unschool, that is wonderful. But it really does start with our parenting/families, and ripples out from there. Do you have any thoughts on this and any advice for someone who is transitioning to respectful parenting but isn’t able yet to take their kids out of school? Or for those whose kids may have loved school from day one and when given the choice want to stay? Thank you for sharing your insight. I am truly grateful for your work. The post of Jitterberry’s that I linked to here has more about this. I think that discussing the negative of schooling is part of the solution, personally. How do we improve on something without discussing what needs improvement? I think it’s simply honest. I don’t personally see positives of schooling that can’t be achieved outside of the institutions. I understand that for some children this is better than their home environment but I think too that this still means they deserve better than the current system. I don’t see how speaking less about the negatives of school will help this. I unfortunately don’t see the system changing any time soon which is one of many reasons I opted out. Apologies if anything in my comment sounded like I meant you shouldn’t speak about the negatives of school. That was not my intent. I really like this post. You shouldn’t have to “adjust” to a life situation in the way that most people mean when they say “adjust” to school–crying, not wanting to go, wanting to leave early. When we “adjust” to a life change that we’ve chosen, like a new job, or a new house, or a new relationship, that’s not what it looks like! When you brought up how people say it’s a human right to get an education it made me think about what that means exactly. School and education aren’t synonyms, which I think is the biggest mind shift people need to make. Children growing up in developing countries don’t need school as much as they need the opportunity to learn and discover things for themselves that they may not be able to discover on their own or at home. I think instead of school being a human right, access to knowledge and the opportunity to discover said knowledge should be a right. Homeschooling or unschooling may not always be an option, therefore instead of school being a place of force and coersion, I think it should become a place that encourages discovory and the thirst for knowledge. Quite idealistic in this day and age unfortunately! Ugh, it is that time of year again. :( I’ve even muted all the homeschooling groups I’m in because the homeschoolers are all debating their curriculums and signing their kids up for a gazillion programs. Then in September all the posts will start from people who are abandoning their curriculums that “didn’t work”…. and looking for a new one! It drives me bonkers! I just listened to a BBC Radio 4 podcast about when children are ‘reluctant’ to go to school. They listened to parents and school psychologists describe the ‘common’ behaviours exhibited in ‘reluctant’ school goers including vomiting and retching at the school gates, tummy aches, crying, insomnia and whole host of other things. It made my heart ache to listen to it. Some kids experiencing this for YEARS. All on the podcast agreed that ‘well the children HAVE to go, it is the law’ until finally someone mentioned home ed which got nicely brushed over. It made me so thankful to be a home educator. I am a teaching assistant in a public school. My sons are 17 and 20, and attended public schools. We changed schools a few times because of moves or because we weren’t satisfied. The best experience they had was a an environmental charter school that was very small and had a wonderful, child-centered atmosphere. In hindsight, I wish I had homeschooled them. I work at a primary school because my sons no longer need me at home, we need the income and benefits, and because I love working with children. On a daily basis I am deeply conflicted about my job. While we do provide a much better daily environment for many of our students whose home lives are less than ideal, we spend most of the day trying to stifle and control children. I am dismayed by the language used when adults at our school speak to kids. When you have hundreds of young children who are mostly confined in classrooms all day, or having to walk in lines in the hallway, the overriding job of us adults becomes crowd control. We are so afraid of the kids getting out of control, being too loud, and getting hurt that rewards/punishments are pervasive. Children are shamed or punished for normal childlike behaviors such as running or hopping instead of walking, touching the walls as they are walking past, talking to their friends, etc. my coworkers roll their eyes when I will patiently listen to a child’s version of a situation. They think it is weak of me to actually try and understand the child’s point of view. I am exploring other options, but for know I have planned to return to my school in the Fall. Until I find employment more in line with my values, I will go to work and do my best to treat the children with dignity and love. I hope in my own small way I can show my coworkers that children are humans that need autonomy, need to be listened to and respected, and are being hurt by the authoritarian environment we are supporting. 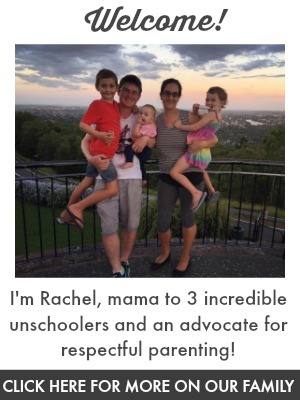 You unschooling moms are my heroes. I’m so glad your children will be able to grow up with freedom and curiousity and won’t have their spirits squashed by traditionally schooling.